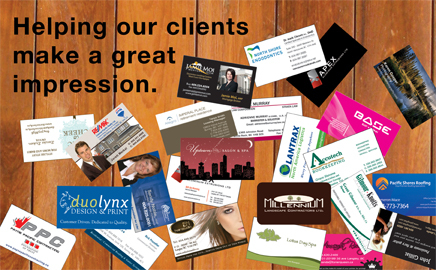 “I am happy to provide a business recommendation for Duolynx Design & Print. I have been using the services of Duolynx for the past four years, including design and printing for my law firm and for two political campaigns. In my experience, Katy and Kerri have been professional, available and cost effective. They have assisted in the design and layout of my political campaign materials, from signage to brochures and have also redesigned the logo for my law firm. Katy and Kerri go the extra mile. They are creative, professional and dedicated to their clients. Printing is the hub of our business. Offset, digital or large format, long or short runs, spot or full colour, we have a solution to meet your every need. A wealth of experience, an eye for quality and the latest technology enables us to provide you with the highest standards and absolute accuracy every time. Whether you require booklets, business cards, business stationery, envelopes, invitations, flyers, posters, brochures, postcards, presentation folders, stickers, tickets; we have the methods and technology to give you great results within a tight budget. We can produce high quality printing from your artwork or provide professional design and artwork services should you require it. Call, email us or request a quote for our competitive pricing.